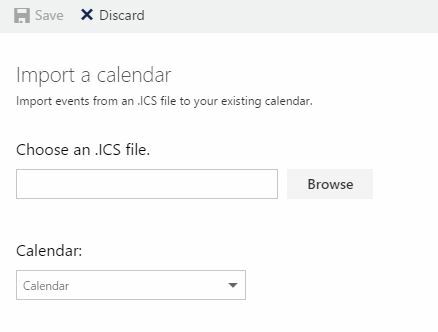 I often access my Exchange Online mailbox via my browser when working from home rather than firing up the Outlook client on the work laptop and recently had cause to add an appointment that was in an ICS file to my calendar. and then clicking on save, and low and behold, the appointments in my calendar, no full fat client required! Not sure how long the feature has been there for but I’m glad it has been added. 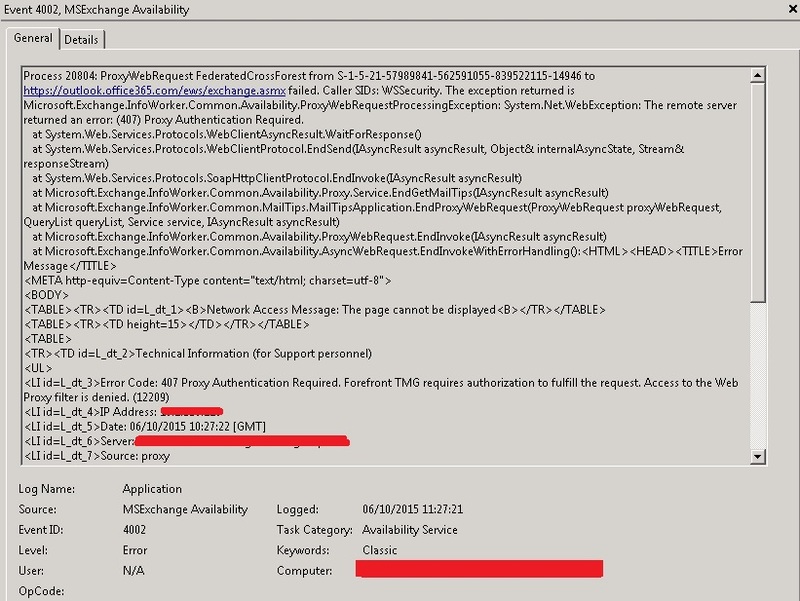 I was investigating an issue with a customer’s deployment where their on-premise Exchange users couldn’t see the free/busy information of the pilot users in Office 365. So, the EWS request was being blocked by an authenticating proxy, in their case TMG. After a little investigation on the TMG it was identified that their default web filtering policy was restricted to Authenticated Users and as this request was coming as the Exchange server account itself it was being denied. 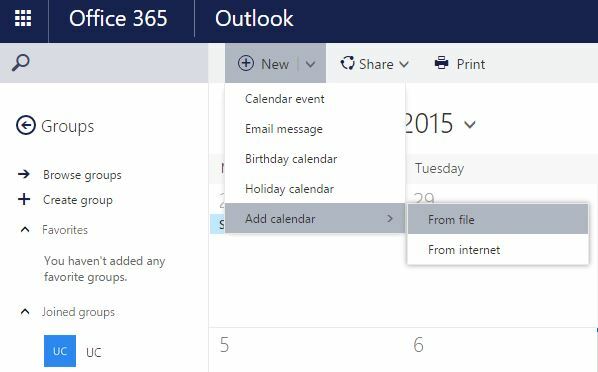 Now, they already had a policy in place on the TMG with a set of addresses that could by-pass the authentication and go straight out, so simply adding *.office365.com to this list allowed Exchange to connect to the EWS of Office 365 and get the free/busy information. Clients were now working as expected and all should have been good, however the Exchange servers should have had direct internet access and shouldn’t have been trying to go through the proxy in the first place. The customer wanted to know why, so I had to get it to work without entering the url in the by-pass list. I tried disabling the proxy options within my Internet Explorer settings on the Exchange servers and confirmed I was able to get out onto the internet without going through the proxy. Now, why wasn’t the Exchange server itself able to do this? psexec.exe -is "c:\program files\internet explorer\iexplore.exe"
Upon opening the Internet Settings in the newly viewable browser window I discovered that there were proxy settings enabled. Disabling these options allowed free/busy to work, interesting! I ran the same test on the other Exchange servers but none of them had proxy information entered. Strange. Until I came across: http://blogs.msdn.com/b/askie/archive/2013/05/09/user-proxy-settings-showing-up-in-local-system-account-correct-way-to-apply-proxy-settings.aspx which talked about how Group Policy settings, if not correctly configured could result in what I was seeing. So I had a check, all Exchange servers had the same policy applied specifying the Internet Explorer proxy options but it was set to “Authenticated users” only, which shouldn’t include the service and system accounts that Exchange was running under. But on the server that was reporting this error I did find proxy information located in the registry key: HKEY_USERS\.DEFAULT. \Software\Microsoft\Windows\CurrentVersion\Internet Settings\Connections and after I replaced this with the blank key from another server everything worked and Exchange was no longer going through the proxy. Not having access to their GPO I wasn’t able to confirm its configuration but I suspect it was changed at some point but the server in question had already applied the incorrect settings which are not superseded by the correct configuration. So the lesson here is, check GPO and the registry for proxy settings and ensure that Exchange servers (and clients) do not go through a proxy when trying to reach Office 365 services and if they must, ensure that it does not require authentication for the Office 365 addresses. Having recently been troubleshooting a customers hybrid Exchange environment I thought I’d write about my experience. The customer had an Exchange 2010 deployment and the Hybrid Configuration Wizard had already been run but they were having mail flow problems from their On-Prem to Online mailboxes. Our IP address is blacklisted, opps! So we proceeded to resolve the blacklist issue, upon investigation I discovered that the Exchange servers were actually connecting externally as the default IP address on their internet connection, which client devices also used. I always recommend that mail servers should be presented externally via an IP address that isn’t used by other services just to prevent issues like this. Once removed from the blacklist we were able to perform the test again successfully, all good, or so we thought! Email was still not flowing and building up in the queue, at this point I turned on verbose logging on the outbound SMTP connector and went to check the SmtpSend folder for the logs. As you can see, after the STARTTLS we should see the “220 2.0.0 SMTP server ready” response followed by the establishment of the TLS connection, but in our case we weren’t and presumably the “Remote” entry was to say it had timed out. Now I had to find a way to manually establish a TLS SMTP connection, I’m not aware of a way of using the standard telnet based approach to do this so had to find an alternative. The customer raised it with their firewall team who advised that there was some “app awareness configured and it only allowed smtp over tls” not sure how it worked from a telnet client or what they changed to resolve it but that’s the dark art of firewall appliances!